So, Anne Hathaway’s getting married. I guess The Loved One can rest easy from now on. MAKE IT EASIER TO VOTE? I DUNNO, IS THAT WISE? The Monroe County election board will vote Thursday on voting centers. The board’s only Republican, Judith Smith-Ille, has opposed a 2012 start-up for the centers. 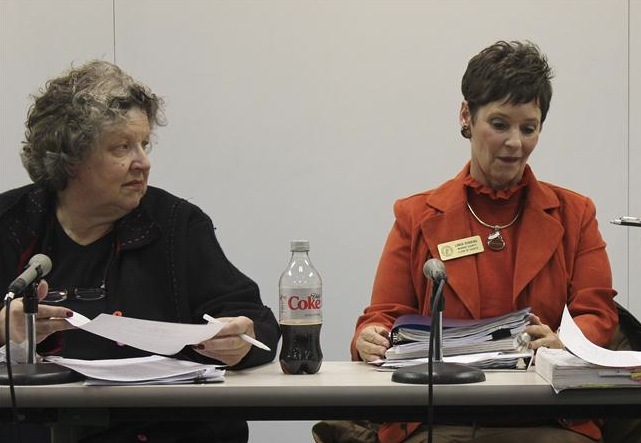 County Clerk Linda Robbins, a Democratic board member, wants them for next year’s election. The idea is the county will do away with its 90 precinct polling places and replace them with strategically located sites in which any registered voter from anywhere in the county can cast a ballot. Everyone agrees the vote centers will make it easier for citizens to do their duty. So why are Smith-Ille and other Republicans fighting the 2012 roll-out? Search me. But is it my imagination or do Republicans as a rule start to get itchy whenever talk turns to increased voter turnout? 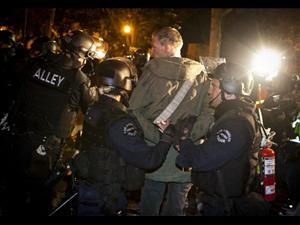 Jails in a few cities and towns of this holy land hosted hundreds of Occupy protesters last night. Los Angeles cops busted up the encampment in that city with a couple of hundred earning their plastic wrist-ties. Philadelphia police applied the strong-arm as well, taking 40 into custody. And whaddya know? Even Bloomington, the Solar System’s center of liberalism, progressivism, and intellectualism, saw its cops wade into a mass of protesters. Officers nabbed five of them and shipped them off to…, let’s see now, Guantanamo? No. The Gulag Archipelago? Uh uh. No. The kids were taken to the county lockup and were promptly bailed out. Apparently, the protesters were not affiliated with the local Occupy gang although they claimed to be “in solidarity” with the campers at People’s Park. And forgive me for judging this book by its cover, but yesterday’s protesters at Indiana University’s Kelley School of Business didn’t appear to be used to such rude treatment. The protesters were blocking the door to a room in which capos from JP Morgan Chase were to recruit new soldiers for their mob. See, when you do civil disobedience, you should expect to be jailed. And when you’re jailed in those circumstances, you should take it with dignity. After all, in an unjust society, the only place for a just human being is in jail. Am I nitpicking here? You tell me. Yes you are nitpicking. All the best people do. When the nits are the size of prom night zits and protruding from the proscenium, what else can one do, but a Curly Howard face wipe before wading through the L’il beasties?